Kamm Consulting believes in maintaining the integrity of the Germanic Apprenticeship Programs and the need to standardize these programs throughout the United States. Maintaining authenticity is extremely important to assure that the U.S. programs will remain competitive to the world-class benchmark standards established in Germany, Switzerland and Austria and will not vary in quality from one region to the next. To do so successfully, an open dialogue is required among multiple key partners including manufacturers, educators and governments in Germany, Switzerland, Austria and the United States. This dialogue should include continuous exchange of ideas, standards and curriculum, and encouragement of student and instructor exchange programs, which will help to maintain the authenticity of these programs in America. Kamm Consulting has already begun this dialogue and has built a strong alliance of international collaborative partners to help "Bridge the GAP" in developing Germanic Apprenticeship Programs in America. Our goal is to bring a turn-key solution to every community in America by engaging key international partners to help develop these turn-key solutions. For example, in advanced manufacturing, companies like Hoffmann Group, FESTO, KUKA, Weiler and EMCO-Maier are not only worldwide leaders in advanced manufacturing, but also in manufacturing apprenticeship training equipment and curriculum. They are known and respected worldwide for their commitment to apprenticeship training. Kamm Consulting is honored to present these references and testimonials from our international collaborative partners which exemplifies the strong working relationship we have built over the years! Thank you international friends and colleagues for your input and support! "For numerous years Festo Didactic has been actively backing the German Skills Initiative in support of the American manufacturing environment, and has invested significant time and energy in multiple communities across the United States, including the Tampa Bay area. Of the German Skills Initiatives I have seen across the United States, very few of the communities are implementing the full 3.5 year apprenticeship program with an emphasis on maintaining the original authenticity of the German apprenticeship model. Bryan's understanding for the German model and how it can be adapted in the United States is unique and progressive. His drive, commitment and leadership to maintain the authenticity and competitiveness of the original occupational standards in Germany is unlike any I have seen in America." © Courtesy of Festo Didactic Inc.
"Festo Didactic and CPCC have joined forces to offer top-of-the-line Train-the-Trainer seminars to college, high school and industrial educators of all levels. In addition, Festo Didactic also offers a full spectrum of vocational training courses based upon German educational and occupational quality standards. Festo Didactic is lending Kamm Consulting its full support in offering turn-key solutions based on Festo Didactic equipment and seminar offerings, complementing his portfolio of other German and European equipment providers with whom we have routinely partnered before in the U.S., Europe and worldwide. "Amongst many other valuable educational benefits, we know that implementing Kamm Consulting's turn-key solutions will offer local communities a solid foundation for and valuable guidance with establishing and maintaining the same level of quality and integrity that can be expected from an authentic German-style apprenticeship program. Bryan Kamm has already successfully established a substantial network of mutually beneficial relationships with key partners, and we are proud of our offerings being a part of the turn-key package offered by Kamm Consulting." As a market leader in the field of quality tools, Hoffmann Group is committed to supporting German Apprenticeship Programs in the U.S. We know the German Skills Initiative can have great success in communities across the country when implemented while keeping the unique standards of U.S. industry in mind. When tailored to achieve maximum results for the designated industry and area, these programs have the potential to stimulate the economy and provide a skilled workforce prepared for the future in any industry. Hoffmann Group’s goal is to support that economic development and investment in our communities through our partnership with Kamm Consulting. As a company with deep roots in Germany, that now has operations in the States, we know that establishing a strong foundation of knowledge and skills in tomorrow’s workforce is the key to success. German ingenuity, precision, and engineering are synonymous with high quality and standards. These are the same terms we use to describe the vast array of tools we offer to customers all over the world. Therefore, we are proud to partner with Kamm Consulting in offering a turn-key solution to bring that dynamic and innovative vision to the U.S.
"EMCO is an Austrian High-Tech Machine Tool manufacturer and a worldwide leading provider for vocational training equipment in the field of metalworking industry and CNC. As a 100% European company we have a lot of knowledge and know-how about the Austrian/German Apprenticeship Training Program, and are very excited that this training method with global reputation is now also being promoted in the US. Together with Bryan’s expertise we are very confident that the Austrian/German model can be adapted to the American system to create a one of a kind of training environment." Stefan Goldberg, General Manager, Weiler North American Corp.
​ WEILER is a German manufacturer of machine tools ranging from small conventional lathes to precision-controlled lathes, introducing our first machine in 1938. 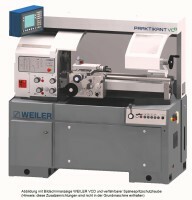 WEILER has firsthand experience in building machine tools that meet the most stringent demands in terms of precision, ergonomics and productivity. Our in-house apprenticeship program has benefitted us corporately and WEILER apprentices continue to gain top marks and official recognition. WEILER North America Corporation was established in 2006 to provide a local presence to the US and Canada. WEILER has partnered with Bryan Kamm on other Skills Initiative Programs and we were impressed with his understanding of both the German Apprenticeship programs and the needs of America’s machine tool workforce. He has an unbridled passion to bring proven Germanic Apprenticeship Programs to America’s youth so they will be the workforce of the future. WEILER’s machinery experience combined with Bryan’s knowledge, vision and alliance partners is a win-win for “Bridging the GAP” and creating a skilled workforce for America’s companies.